According to the Swedish Migration Agency, nearly 163,000 asylum seekers have arrived in the Northern European Country, more per capita than any other country in the EU. Due to a lack of housing, the Migration Agency has had to put people in hotels and hostels around the country. 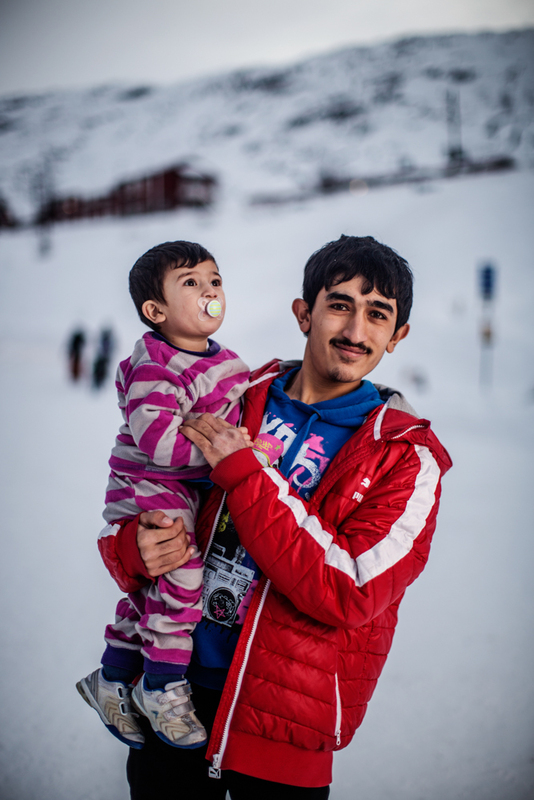 The most northern location is Riksgränsen, a hotel 200 km north of the polar circle that usually houses extreme skiers and snowboarders, and now accommodates approximately 600 refugees. 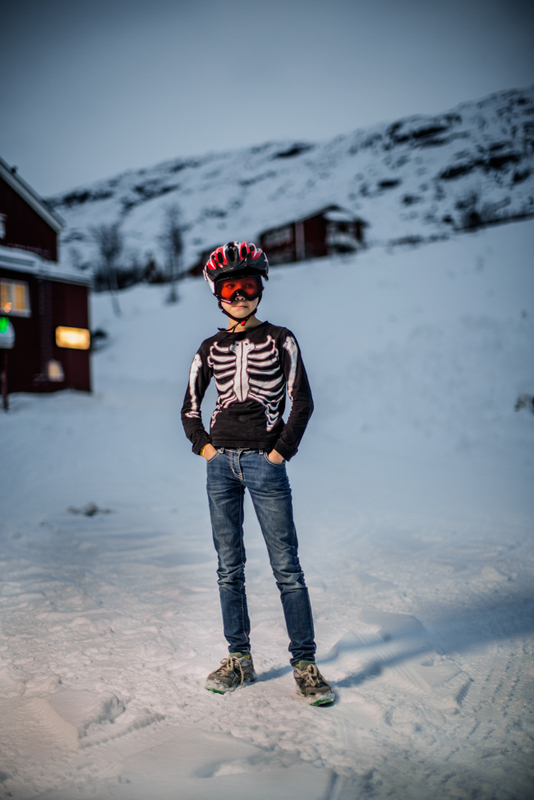 The Riksgränsen area is so far north that, for the most part, it's in total darkness. During the month of January, the sun does not rise above the horizon. Mustafa Dagher, 37, holds Nuha, who caught chickenpox. Many of the kids have caught the disease and Nuha is screaming because of the itch. 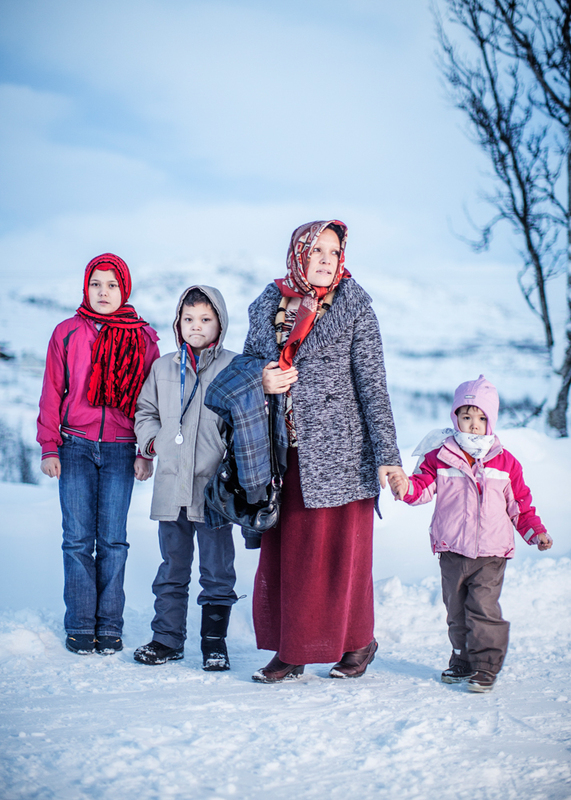 Adila Mohsini with her children, Zahra Rizai, Jaafar Rizai, and Adis Rizai, came from Afghanistan to Riksgränsen two month ago. 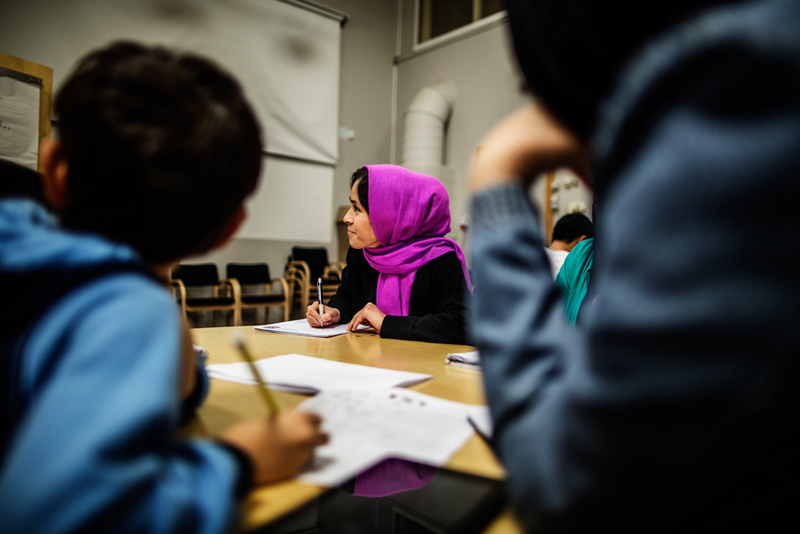 The Swedish Migration Agency estimates that around 40,000 refugees from Afghanistan have reached Sweden in 2015. 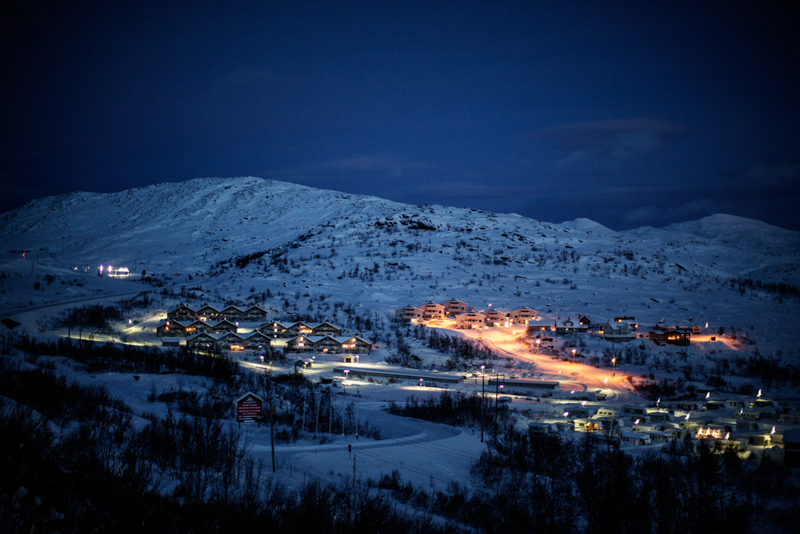 Riksgränsen is a small Swedish town 200 km north of the polar circle, right on the border with Norway. Until early the 1980s, the only communication by land was via the railway that transports Iron from the Swedish town of Kiruna to the Norwegian harbor in Narvik. 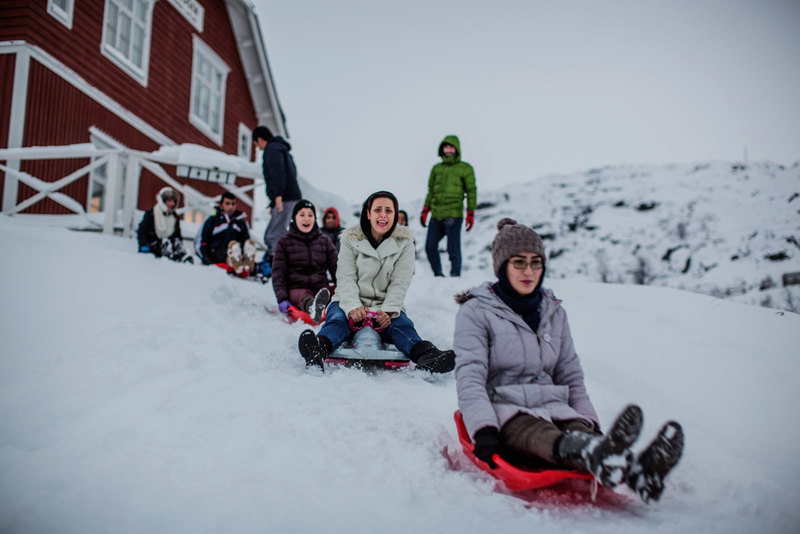 For most of the immigrants, this is the first time they experience snow. The Hotel invested in over 100 toboggans. The kids play in the snow for the few hours when there is at least some light present. 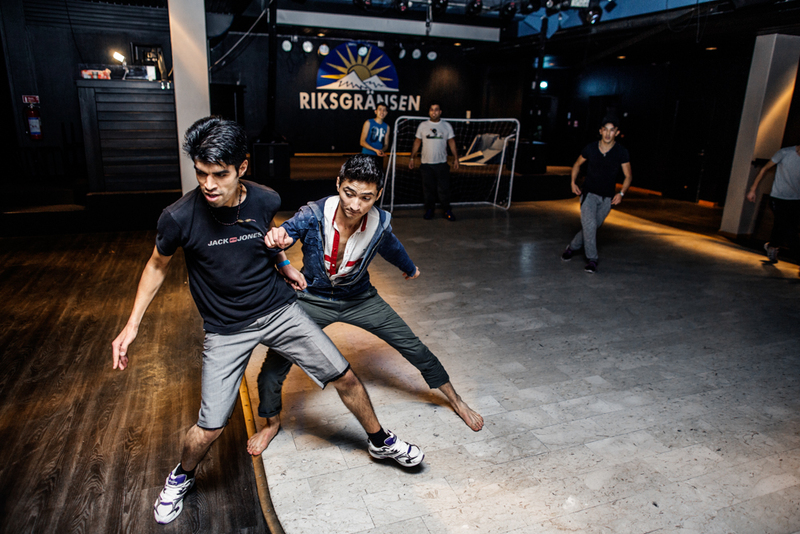 The hotel's nightclub has been transformed into a small soccer field. Kazim Balkhi had a school in Afghanistan that got shut down by the Taliban because he refused to stop teaching English. He feared for his life and fled to Sweden. Balkhi has taken it upon himself to teach English and the little pieces of Swedish he has learned to help hid fellow countrymen. 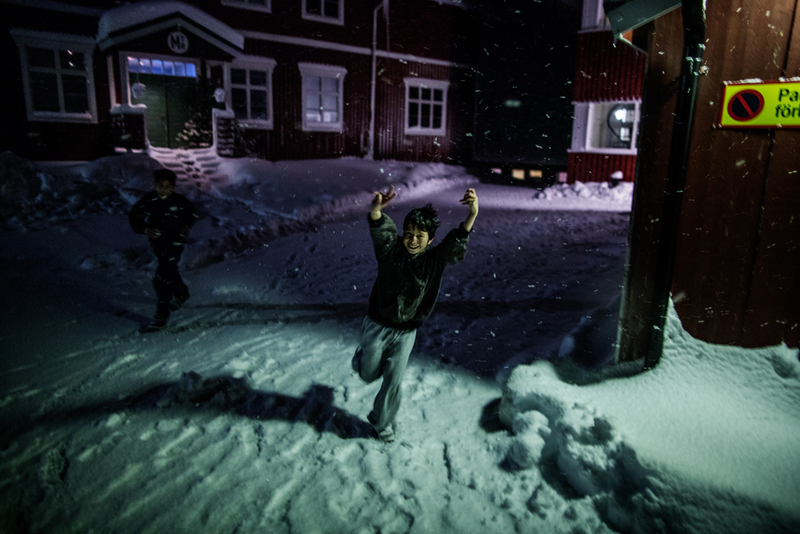 The kids experience the polar winter for the first time and play in the snow for the few hours when there is at least some light present. 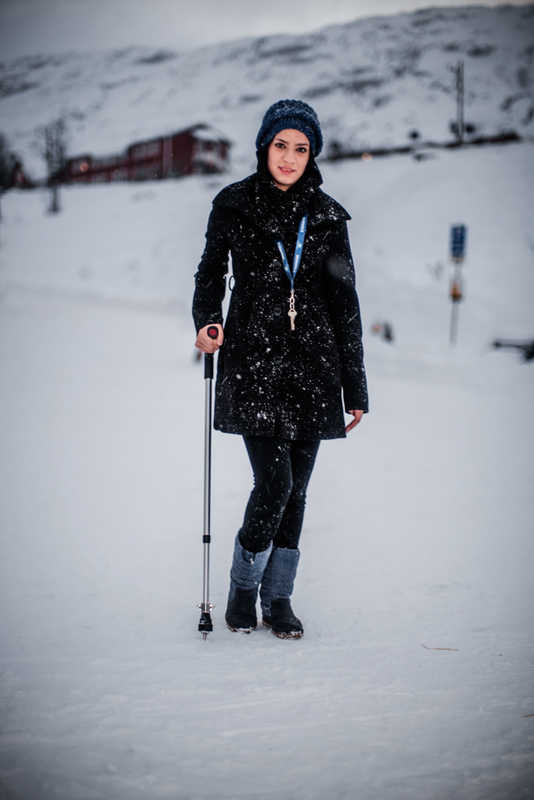 Masome Hasani came from Afghanistan to Riksgränsen with her mother. She asked me to take a picture of her brushing her teeth. 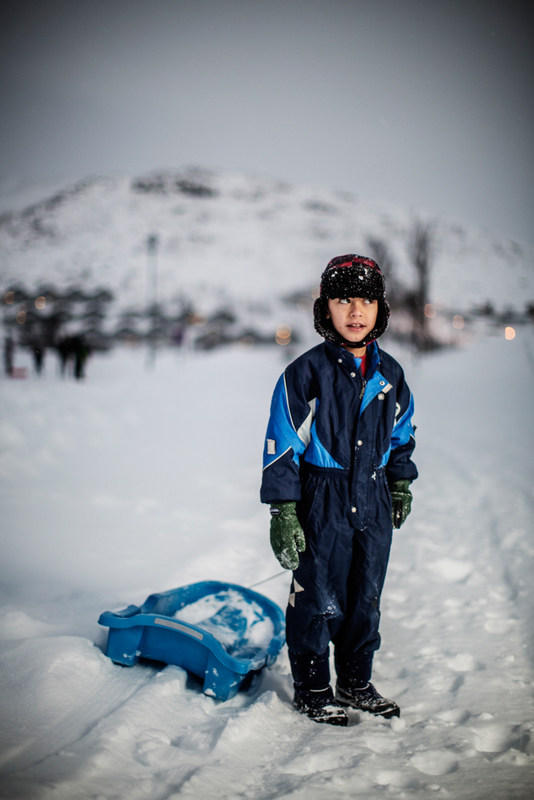 Every day a bus departs to the closest town, Kiruna, which is 1,5 hours away and is built around an iron mine. Most of the immigrants come from areas that are more populated than Riksgränsen. Peter Nilsson started working at Riksgränsen in the summer of 2015. He had no experience working with refugees before. 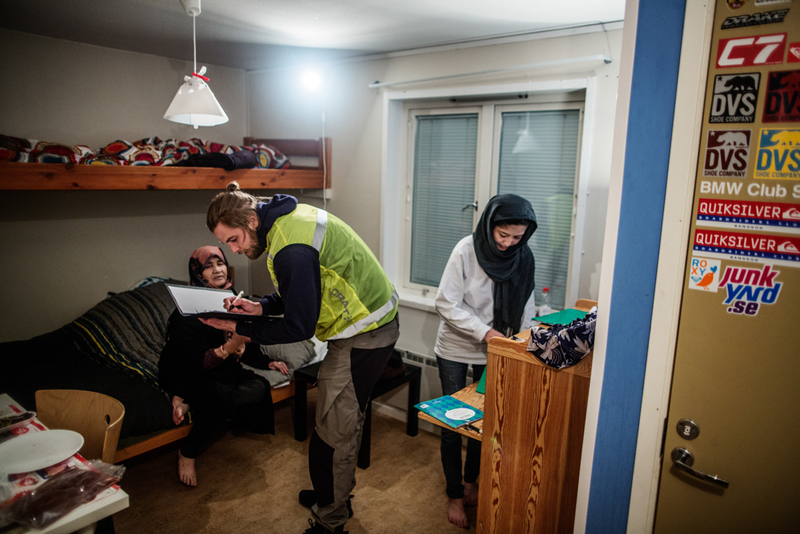 In this picture, he is checking IDs, something the staff do to control that people stay in the right room and to make sure its only people that belong at Riksgränsen who stay there. 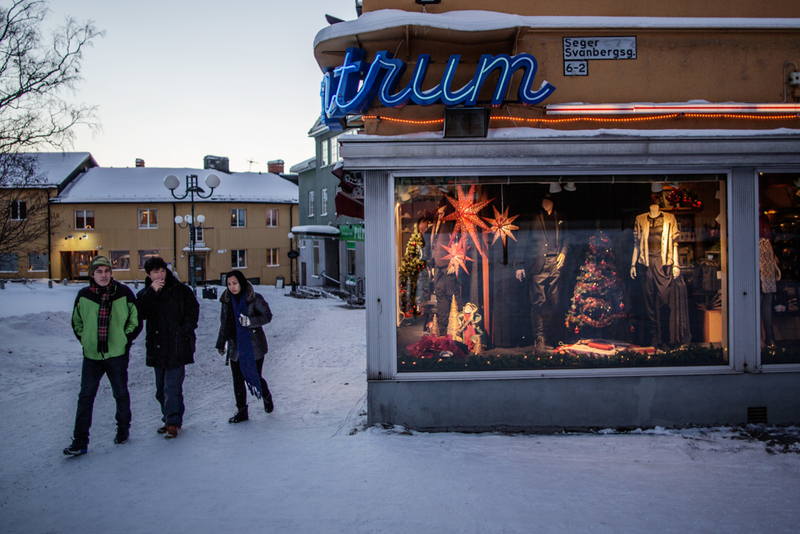 The refugees get money from the Swedish government to buy winter clothes, but the staff mention that some men choose to buy cigarettes with the money instead. Abdullah Hammadi, 15 years old from Saladin province in Iraq. 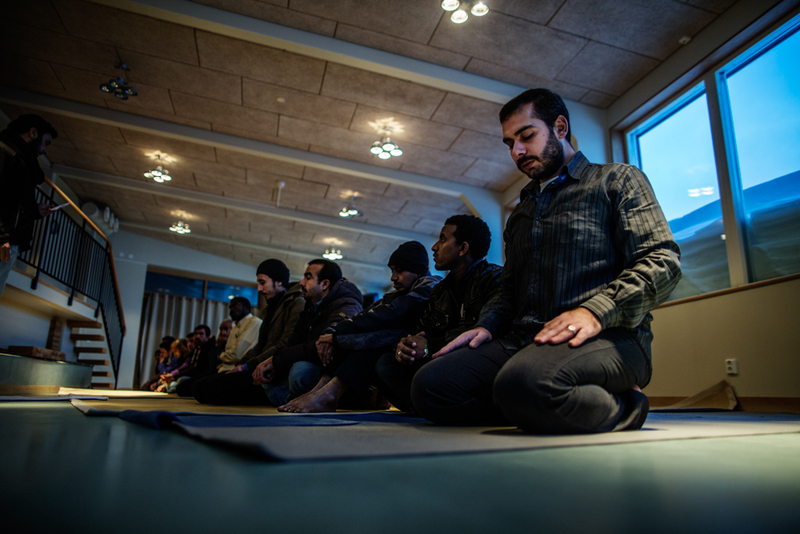 Becuse of the lack of sunlight, refugees have had to use different methods to determine the prayer times. 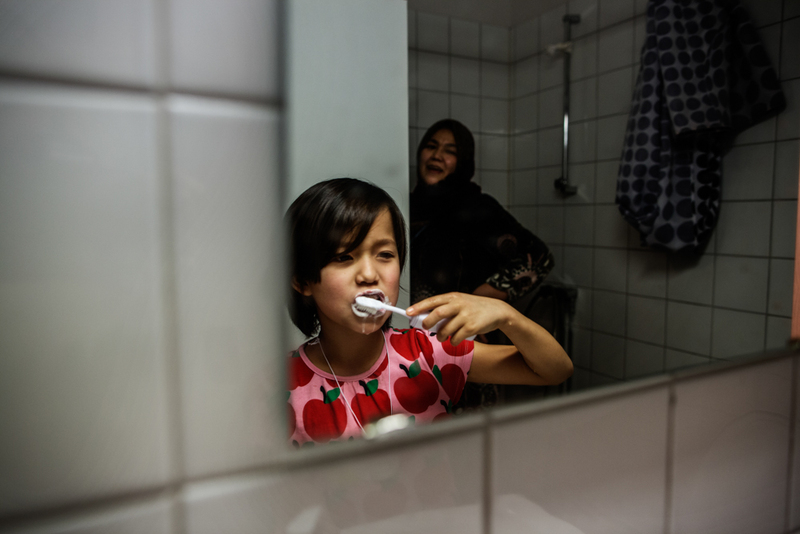 Ishaq Alrawi came from Fallujah, Iraq through Turkey to Sweden one month ago with her mother Nuha and her father. Jean Paul JP Pozzi, Manager of Riksgränsen, and his partner Kristiina Lampinen. Jean Paul says that everything happened very fast this fall after the hotel decided to accept 600 refugees. The refrigerators where empty and none of us had real experience working with asylum seekers, he says. JP likes his job although he says its hard to arrange things so that all people from 23 different nations will be happy with everything. Mansour Abbasi was born in Teheran but came to Sweden in the late 1980s. 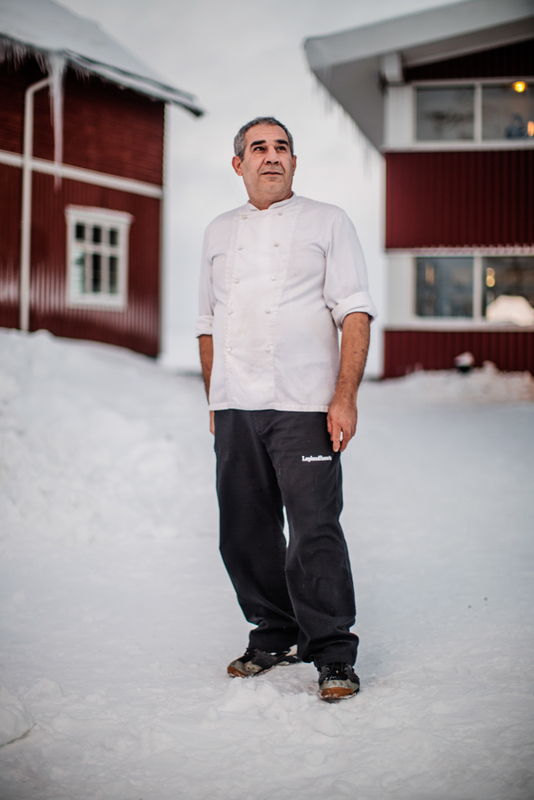 He is now the head chef of Riksgränsen and has some asylum-seekers from Iraq working with him in the kitchen. He says this felt strange at first, since he spent years in a military prison camp in Iraq where he was tortured. 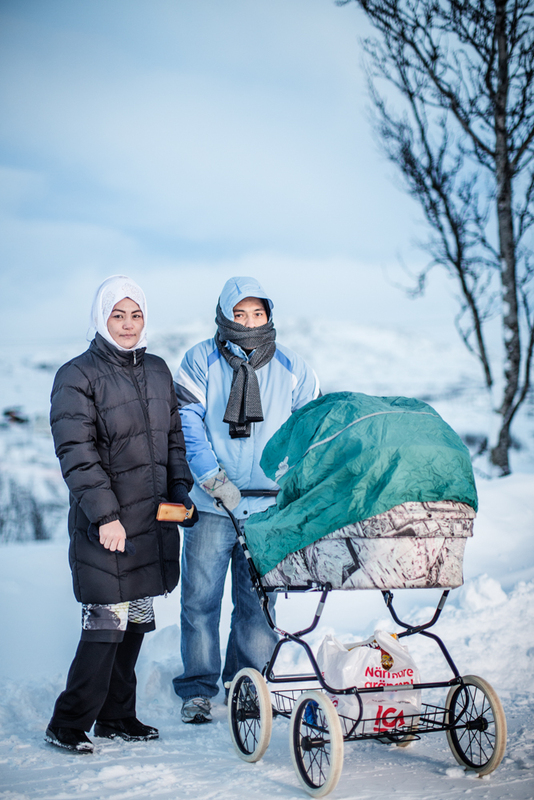 Mohammed Ashamed from Syria came to Riksgränsen from Aleppo with his daughter Amil. 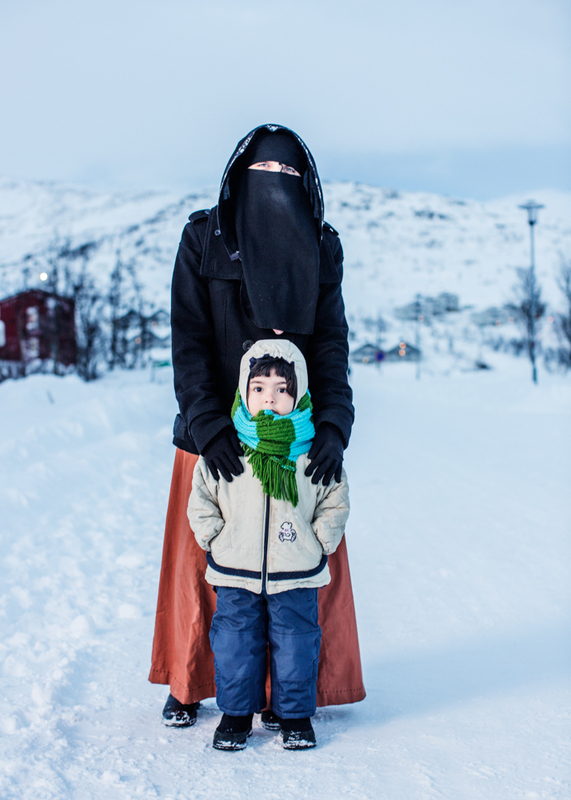 Roya Hosseini, 14, fled with her family to Sweden. 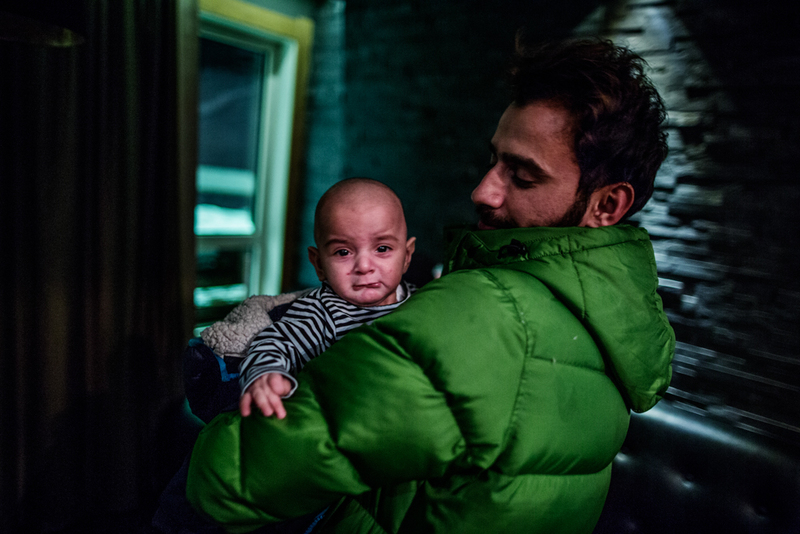 Most of the refugees that go to Sweden are men who flee and hope to make it to Europe so they can have their family join them legally once they're there. 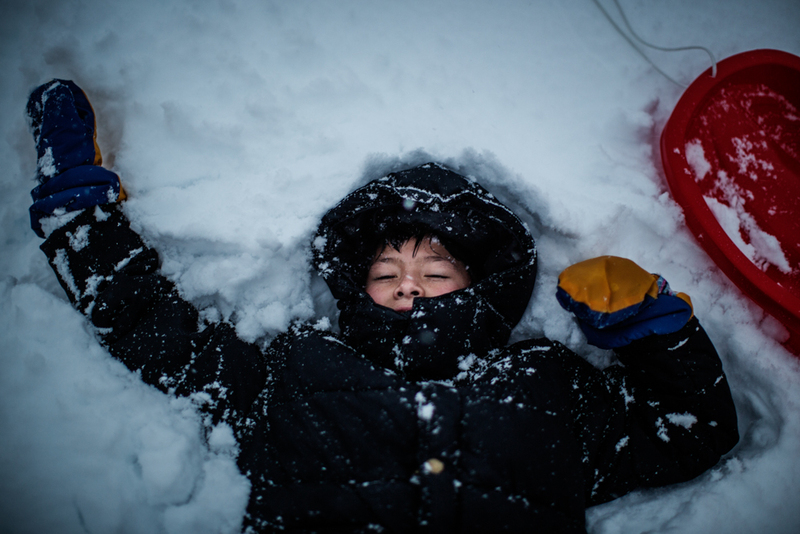 Marwan Ayab, 10, from Damascus, Syria is out playing in the snow. Segan Johannes, 13, from Eritrea is one of many Eritreans who have fled oppression in their home country. 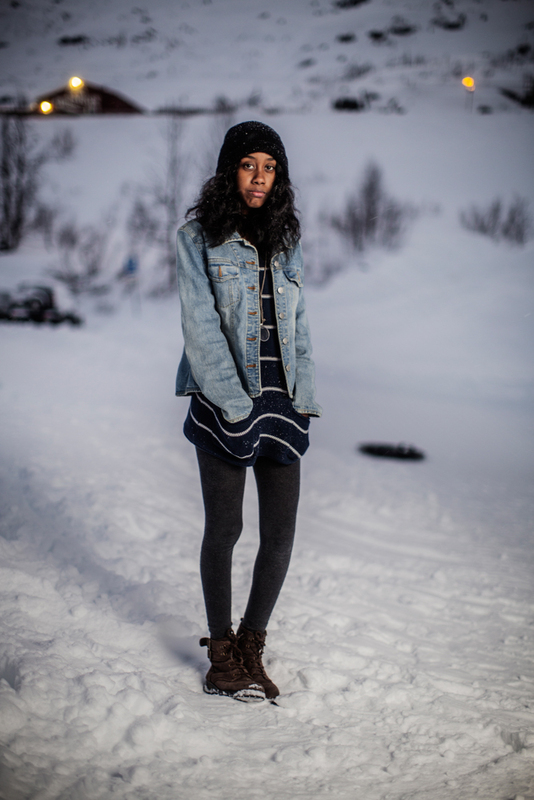 Sweden has a growing population of Eritreans; over 20,000 people from the small African country have arrived. 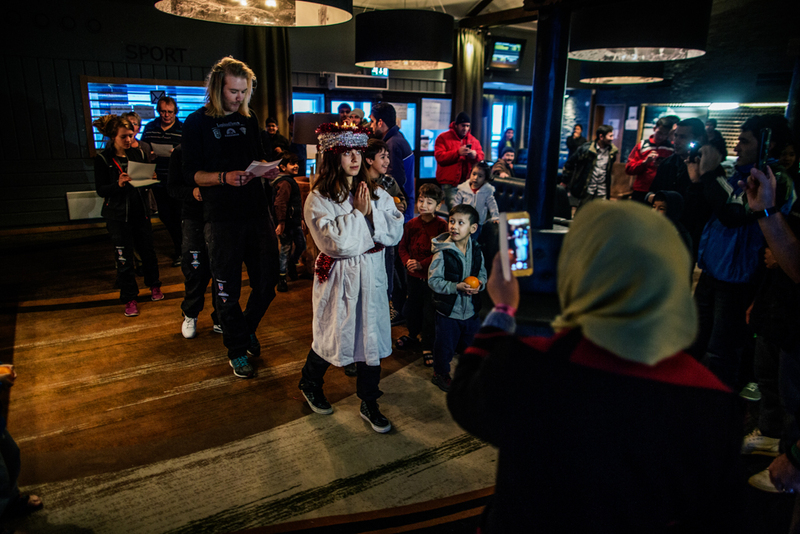 The staff at Riksgränsen decided to arrange a traditional Swedish Lucia Celebration in which women dress up in white robes, but due to a lack of proper costumes, they had to use a robe from the spa. 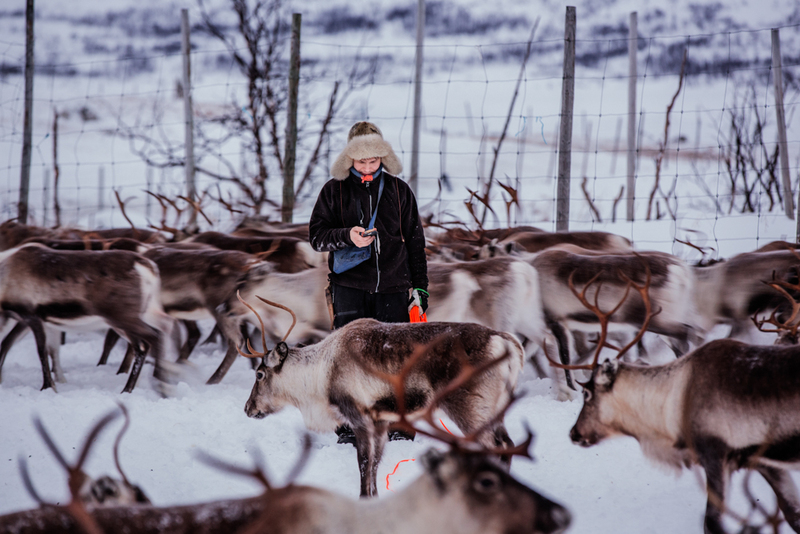 Besides the tourist industry, the only business in Riksgränsen is Reindeer herding, controlled by the indigenous Sami population. Saker Hossein Nabavi, his wife Sakine, and their child came from Afghanistan where Saker used to coach the Afghani Boxing team. He now teaches boxing classes in the gym a couple of times a week.